In other words, whales are taken into account as a sacred creature as well as the savior for fishermen. From long ago, the fishermen of coastal areas have considered whales as a rare kind of mammal that do not harm anyone and instead lend a helping hand when people unfortunately meet storms on their voyages. In other words, whales are taken into account as a sacred creature as well as the savior for fishermen. In Vietnam, the creature is specially attached with Nguyen Anh— Emperor Gia Long of Nguyen Dynasty as legend says that they saved the Emperor from ship sinking. After ascending the throne, Emperor Gia Long awarded whales to be a minister in his court. From that moment on, whales were widely accepted in the country as a god. With such spirit, fishermen express much admiration towards whales as they avoid calling whales directly and instead use the title Ca Ong or Ong Nam Hai (Whale God). They built temples (Lang Ong) to store whales’ bones, with altars of two guardians—Ly Ngu’s on the left, and Ly Luc’s on the right. In addition, they celebrate Whales Festival with the belief that showing respect to Whale God is the assurance of not only safety but also prosperity of the village they live. 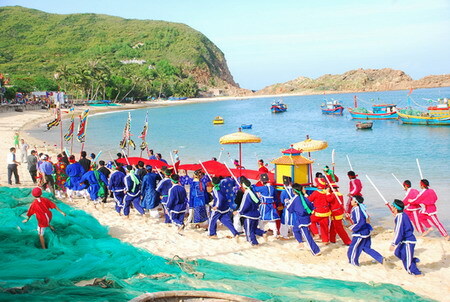 The festival takes place within two days in the middle of the third lunar month with the presence of all villagers and fishing boats. The whale temple, together with of every house and boat in each village, are gorgeously decorated. In the first evening of the event, at whale temple, village elders carry out a peace offering with oblations (no seafood allowed) offered when the oration is presented. Visit the sea at dawn on the next day, visitors will find the operation of a boats procession indicating fishermen’s sincerity towards their Whale God. Lastly, midnight marks the official ceremony with incense offerings from children and classical operas performed by orchestras. See more: Things to see in sa pa Vietnam in this winter..